How would you like to pick up a free 64GB Samsung Galaxy S9? If you switch to T-Mobile, activate two lines and trade in an eligible handset, you will receive 36 monthly bill credits in the amount of $20 that will cover your purchase of the Galaxy S9. You might have to lay out the $20 for two months before the bill credits start kicking in. Current T-Mobile subscribers can partake in the deal if they add an additional line and trade in one of the eligible handsets. Tax on the Galaxy S9 is due at the time of sale. 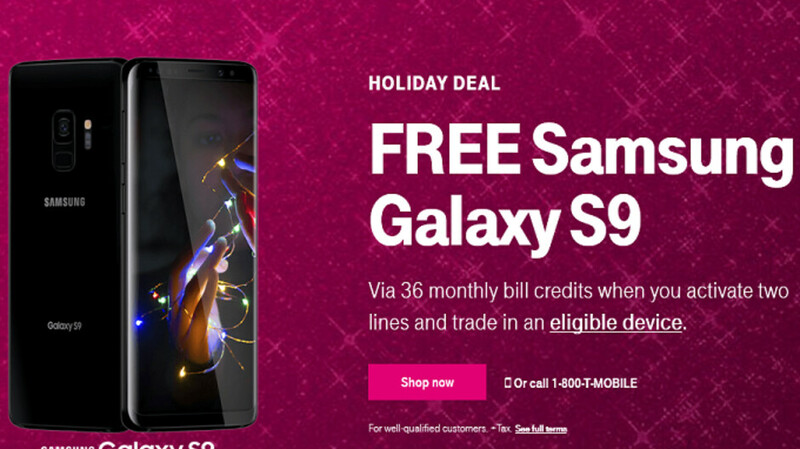 This is a limited time holiday deal only, so if you are interested in snagging a free Samsung Galaxy S9 from T-Mobile, you might not want to procrastinate until it is too late. I find it interesting that the devices eligible for trade in don't include any iPhones. I hardly consider this a deal. Worst holiday promo ever. Seriously not only do they insist on at least one new line which is always a crapshoot. But they also want a trade in and then wrap it up with bill credits over not one year, not 2, but wait for it … 3 years??? Who on earth falls for this garbage?